A large number of people seek opportunities for higher studies and permanent settlement in the western world due to better quality of life and better financial prospects. In most of the developing countries, English is not the first language whereas English is the most used language in countries like USA, UK, Australia, Canada, New Zealand etc. It is, therefore, very important for these countries to ensure that the people wanting to pursue higher education or work there are proficient in English. as a language of communication. This is one of the most popular English tests that people take to go abroad for either higher study or work. The score is measured in Bands and it has a nine-band scale to identify levels of proficiency, from non-user (band score 1) through to expert (band score 9). IELTS test is of 2 types – Academic, which is meant for people applying primarily for higher education or professional registration in countries like UK, Canada, Australia, New Zealand etc. and General Training is meant for those migrating to such countries for work. Both these test types provide a valid and accurate assessment of the four language skills: listening, reading, writing and speaking. pertinent for any standard test to include all these four skills. IELTS tests a candidate on all the four skills of the language – Writing, Listening, Reading and Speaking. The IELTS test assesses your abilities in listening, reading, writing and speaking. Listening and Speaking are the same for both Academic and General tests, but the subject matter of the Reading and Writing modules differs depending on which test you take. Essay – One has to write an essay of 250 words in 40 minutes. Listening Test – The duration is 30 minutes for listening to a recorded conversation and writing the answers on the Listening Sheet. After the listening is over, 10 minutes are given for transferring the answers on the Answer sheet. Reading Test – Passages are given on diverse subjects and the candidate is required to read the passages and then answer the questions given. The duration of reading module is 1 hour. Speaking Module – The duration would vary from 11-14 minutes. The candidate is asked various questions and the entire conversation is recorded. The various aspects of the candidate’s speaking skills are assessed. When and Where is IELTS test conducted? IELTS test is conducted all over the world on pre-specified dates. The exam is conducted several times a month for both Academic and General modules and is generally scheduled on Saturdays of the month. Out of 4 modules, Writing, Speaking and Reading are conducted together whereas the speaking module is organized separately either on the same day or after a short gap and the dates are intimated to the candidates. Noida, Chandigarh, Amritsar, Ludhiana, Jalandhar, Moga, Bhatinda, Patiala, Jammu, Ambala, Karnal, Dehradun etc. Chandigarh is the hub of education in North India and, therefore, it is a wise decision to look at options to prepare for IELTS in Chandigarh. 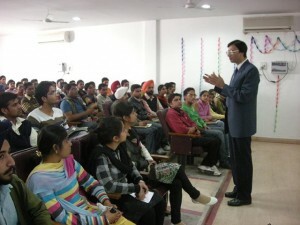 Chandigarh offers best learning opportunities along with a nice environment. There is no doubt that the quality of training in the city is of excellent quality due to the availability of exceptionally good trainers and their overall exposure to English language. Why Global Voice should be your 1 st choice for IELTS training in Chandigarh? Rich experience in IELTS training. More than 40,000 students trained till date including senior doctors, professionals and a large number of students. Such a rich experience makes us as the top IELTS institute in Chandigarh. All the 4 IELTS modules are taken up every day with detailed discussions as a part of the regular program, which makes it the best IELTS classes in Chandigarh. Highly structured teaching approach is followed to enable the students to achieve great results. Applied grammar sessions are an integral part of IELTS classes since grammar is the base of the language and its correct application and usage result in higher band scores. Doubts classes for clearing the doubts of all the aspects of IELTS Tutorials. Special English Language Enhancement classes are conducted to improve the language skills of the students since this has a direct bearing on the IELTS preparation. My experience with Global Voice was really great. All the faculty was good, with expertise in teaching. The techniques taught here enabled me to get high in my Ielts exam. Highly recommended to those who wants to join best IELTS coaching institute in Chandigarh for good band score. I was a student of IELTS at Global Voice and I am very happy with their services. I have received high band in IELTS exam, which is what I needed to continue my career. I would highly recommend Global Voice to everyone who is taking the IELTS exam. It was a fabulous experience with Global Voice, I was guided very well. Teachers are always available for the students and ready to teach new methods. Crack IELTS Exam with good score. Highly recommended. I am very much overwhelmed with the kind support I got from the teachers to clear my IELTS exam with a good score. The staff is very cooperative and friendly. They motivated me a lot to achieve my desired score. I would refer other students to learn from here.